Sunday I was carrying groceries home and fretting over a hymn for the Feast of Stephen. The picture doesn't look like much. But precious gems galore are in the making, on this cut evergreen in the winter sun. The fretting was about this. Is it fair to salvage edification and rejoicing out of other people’s tragedies? Maybe there would be even more to rejoice about if Stephen had sympathetic countrymen and could live a long happy life with a wife and kids and go right on being filled with the Spirit and working signs and wonders. But meanwhile I stood leaning right up close, swaying like a charmed cobra to catch the full optical effect. 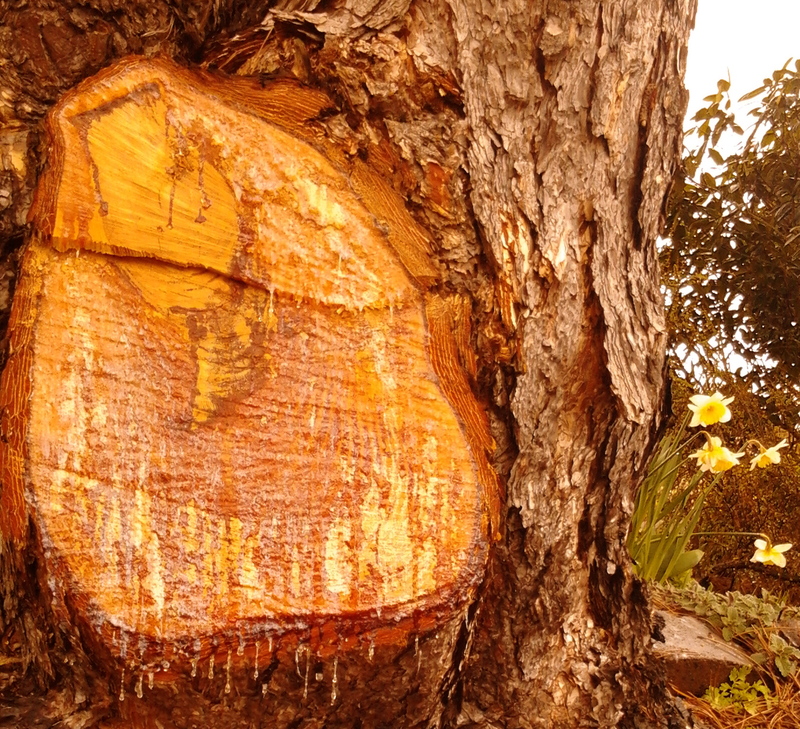 The sap was spilling over with a keen fragrance, like incense. The taste was sharp clear incense too, when I touched a drop to my tongue. 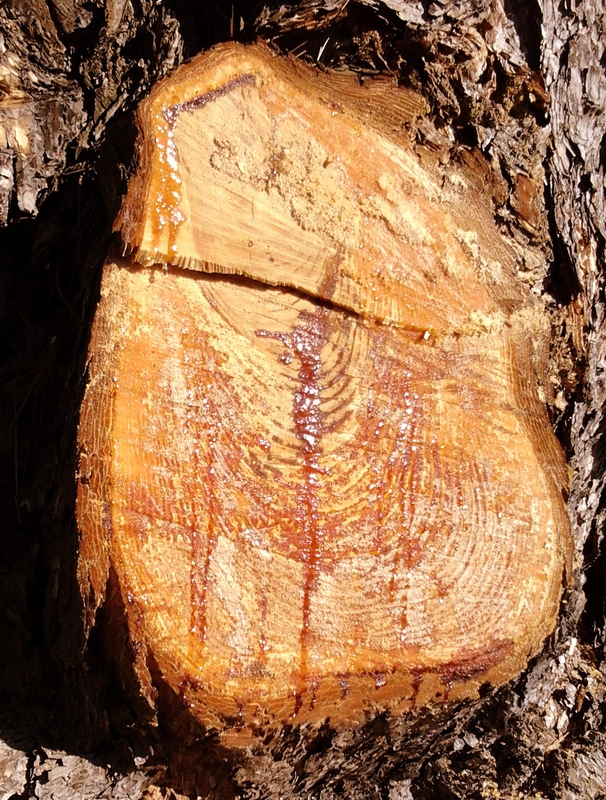 The rings of the tree formed a lovely pattern, delicate to the touch. The fine lines called to mind the 1,000 year old downed pine described by gentle gentlemanly explorer Enos Mills. (He deciphered the individual growth rings and left us a beautiful book about the old tree and the historic events that it lived through.) But most striking was the sunlight. It didn’t shine through the sap, but shattered into glitter against it like moonlight on snow. It sparked the surface into crimson gems, like cut rubies set in sidelights of sea-green and gold. That was a lot of special effects emanating from one cut tree. It occurred to me that if a tree could manage all that, then what light shattered off a young man with a “face like an angel” who was a good orator and died praying for his executioners? (The eyewitnesses after all were also the people with stones in their hands, except for Saul of Tarsus minding the coats, though who would be stealing coats at a time like that?) If a tree of rings and gems could spell its own story, it might be “Martyrdom is a quantum transformation. Don’t bend your mind on it now. Pick up your vittles and walk.” But first I scooped up a liquid gem on a wood chip and took it home for the icon shelf. P.S. – 6 weeks later, the tree stands at the front of a bed of daffodils. The sap froze in rows of amber icicles all along the base. The wood has aired out to a lovely gold, and lovelier still are fine gold lines etched all around the bark. Worth another visit on some sunny day. This entry was posted in Uncategorized and tagged strolling. Bookmark the permalink.